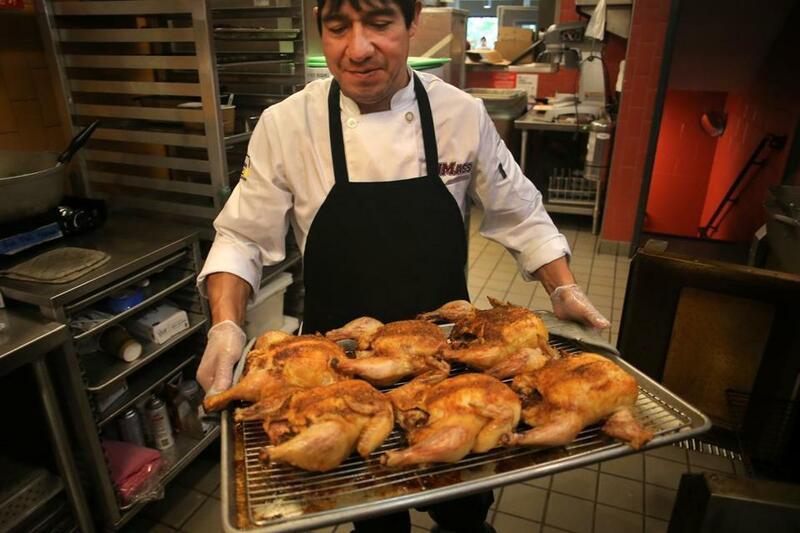 Manuel Morocho pulled roasted chickens from the oven. AMHERST — Each tender, elegant curl of local lettuce was pristine, fit for a glamour shot in a high-end food magazine. And, indeed, there was a professional photographer behind the buffet, snapping pictures of the perfectly manicured bowls of New England Cobb salad for yet another glowing write-up somewhere, piled with crisp, thick shards of bacon, hunks of dense, rich blue cheese, and strands of moist white chicken. But not just anyone can order this high-class salad. 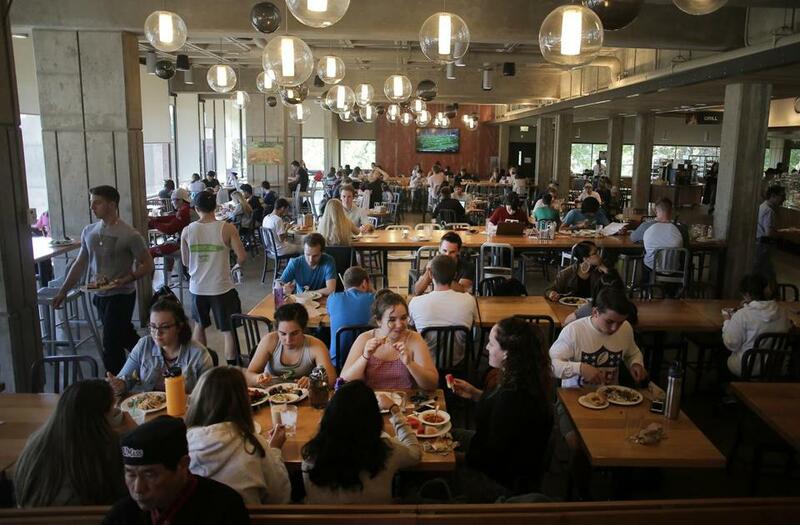 To eat at one of the University of Massachusetts Amherst’s best-in-the-country campus dining halls, you must be student, faculty, or staff — or know someone who is. So, undercover in my remarkably lifelike Doughy Dad from Quincy disguise (again), I approached the buffet and asked how I might acquire such a salad. “Oh, you can take these,” said the woman who seemed to be managing the photo shoot. These weren’t specially primped for pictures: Every plate was camera-ready. The picture-perfect salad was a nightly special. But by the standards of Hampshire Dining Commons, it was hardly extraordinary. “The freshman 15 is very real here,” said Bradley Polumbo, a second-year student who agreed to be my accomplice. 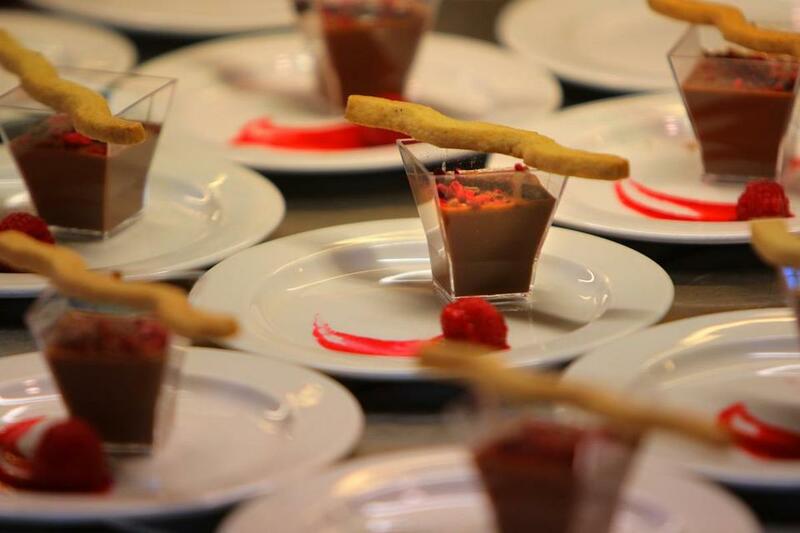 Over the course of the last decade, the dining program here has gone from fairly standard — the piles of chicken nuggets and steam trays of pasta of my college years — to something resembling a high-end Vegas casino buffet. Some of the commons serve until midnight, so students pile in at all hours, and sometimes wait in long lines to swipe the badges that allow them entry to the four major all-you-can eat dining commons scattered around the sprawling campus. As upperclassmen hold court at their tables, they sip glasses of infused waters — hibiscus, pineapple, cucumber-mint — drawn from burbling dispensers. There are pizzas, of course, but also lamb vindaloo and local yellow onions and fresh mussels in pungent broth. The Princeton Review, the national college prep and admissions services company, has ranked the food here the best of any campus in the country, two years running. But the price of college food has become a bit of a touchy subject, after the author Malcolm Gladwell called out Bowdoin for the cost of its highly ranked dining program. (Bowdoin was not thrilled.) And over the summer, Polumbo wrote an op-ed in the Globe that raised some questions about whether maintaining an award-winning food program was worth the considerable expense — shouldered by students at a public university that recently raised tuition 3 percent for in-state undergraduates. The crown jewel of the Amherst campus’s cuisine is Hampshire Dining Commons, recently renovated into a modern space with a massive oval kitchen at its center — the “egg.” Students swarm the stainless steel and glass buffet stations that line the outside, filling their plates with surprisingly moist hand-carved roasted pork loin from a New England farm or tacos on corn tortillas made in-house. Are there french fries? Sure, there are french fries. This is still fundamentally a college mess hall. But they’re hand-cut and made with local potatoes (russet and sweet). And if that’s not good enough, there are roasted sticks of carrot so tasty you might as well skip the starches anyway. To be clear, Polumbo’s complaint wasn’t about the quality of the food, which is undeniably quite high, even if the falafel can get a little dry sometimes. “It’s just so extravagant,” Polumbo said as we walked across campus, and many students can’t avoid it. For first- and second-year students who live on campus, the cheapest meal plan costs $2,700 a semester. The unlimited plan is $2,978 — a significant expense for students of modest means. But that’s also somewhat less expensive than at other colleges in Massachusetts. Northeastern’s 19 meals-per-week plan costs $3,780 per semester. Tufts offers a 220-meal plan for $2,926 per term — about $200 more than a similar plan at UMass Amherst. And the cost of the dining services at UMass Amherst are wholly covered by the meal plan revenue. Given all the variables, the UMass program is a little hard to understand as a value proposition. On the one hand, if you air-dropped this whole operation into Boston and charged all-you-can-eat prices, I can’t imagine charging less than $30 a head. But would I, an aggressively hungry middle-aged man who daydreams about a well-appointed brunch buffet, pay something like $6,000 for eight months’ worth of unfettered access to this spread? That’s about the same as the grocery budget for my family of three over the same period, spent on one person and a handful of guest passes. Ken Toong, executive director of Auxiliary Enterprises at UMass Amherst, said the dining program actually comes in cheaper on a per-plate basis than its competitors. Toong, who built the program into something special since taking over 19 years ago, said that buying directly from local farms rather than from middlemen keeps prices in line with what bigger distributors might charge. They buy whole chickens instead of parts and break them down in-house, and portion out proteins carefully — a typical serving of meat from one of the buffets here is two or three ounces, and students can come back up for more if they want it. Maybe most telling is that 77 percent of seniors, who aren’t required to keep any meal plan at all, still sign up. Satisfaction surveys rate the food an 8.5 out of 10 now, compared to 5 out of 10 when Toong started. The food reflects what today’s students care about, Toong said: value, yes, but also sustainability (so-called trash fish, populous but little known, are a menu staple) and healthfulness. Toong said the school is looking to enter long-term agreements with area farmers that help the school guarantee access while shoring up the farmers’ finances. Last year, the school spent almost $2.5 million at Massachusetts farms. 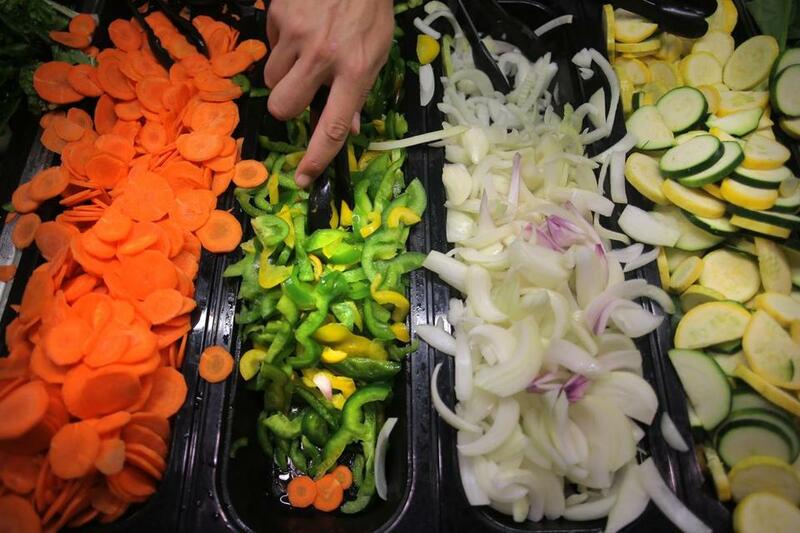 A student selected vegetables at a stir fry station. So the mackerel with garlic black pepper sauce is made with cilantro from Queen’s Greens in Amherst, and the yellow onions and mushrooms in the mushroom cream sauce on the pasta bar are local, too. The ham on the Cuban sandwich is from Maine Family Farms in Portland, and the crispy cornmeal cauliflower — plant-based proteins are increasingly popular with students, Toong said — is also local. Polumbo and I walked from Hampshire straight over to Berkshire Dining Commons, with a menu that skews a bit less locavore and a dining room that feels a bit more clubby. The Patriots were going to be on the big screen that night, and the line to get in grew very long. Students often pick which cafeteria to eat at based on proximity, Polumbo said, but others swear by their favorites. Inside, lines were forming for a slightly shaky chicken Chesterfield — appropriately cheesy, but a little slimy underneath — and a well-appointed stir-fry station in the international section. We brought plates loaded with gently sauteed local vegetables and tender pork back to a high-top table in front of a bay of windows. The sun was setting over the wooded Western Massachusetts hills. If you’re basing your decision on where to go to college on what’s for dinner, you might be doing it wrong. But if you’re a doughy dad from Quincy, it’s enough to make you wonder whether you ought to get that master’s degree, after all.